These are not really cookies and not really crackers. They’re a little sweet and a lot savory. Cookers? Crackies? No matter. They wouldn’t be out of place in a cocktail party spread or on a cheese board, but they’d also make a great ending to a meal by themselves alongside a glass of port. Or, you know, just leave a jar of them on the counter. They’ll be gone before you know it. Savory Oatmeal Cookies with Rosemary, Black Pepper, and Parmesan: Sprinkle 1/4 c. hot water over 1 c. rolled oats in a large mixing bowl. In a smaller bowl, whisk one egg with 1/3 c. olive oil and 1/4 c. light brown sugar. Pour this mixture over the oats and stir to combine. In a third bowl (I know, sorry! ), mix 1 c. flour with 1/4 tsp. baking soda, 2 tsp. chopped rosemary, 1/2 tsp. salt, and 1/2 tsp. freshly cracked black pepper, then stir in 1 c. freshly grated Parmesan cheese. Gradually stir the flour mixture into the oat mixture until well combined. Roll into 1″ balls, flatten each to 1/4″ thick, and place on a parchment-lined cookie sheet. They can be close together because they don’t grow much. Sprinkle a pinch of salt (flaky sea salt if you have it) on top of each cookie. Bake at 350 for 15-18 minutes, until the edges are crisp and golden brown, then move to a rack to cool. Pictured on the left: Savory Oatmeal Cookies. On the right: Parmesan and Black Pepper Crackers. Just add Rye Crackers with Apricot Chevre Spread, a bowl of salty nuts, and the house cocktail. This entry was posted in Baking, Cookies, Desserts, Easily Multiplies to Feed a Crowd, Snacks and Apps and tagged baking, cooking, DIY, family, food, happy hour, homemade, lifestyle, recipes on February 28, 2012 by emmycooks. Oh wow! I’ve never made a savory cookie before. I must give ita go though as these sound absolutely delectable. They are good. And definitely a conversation piece! 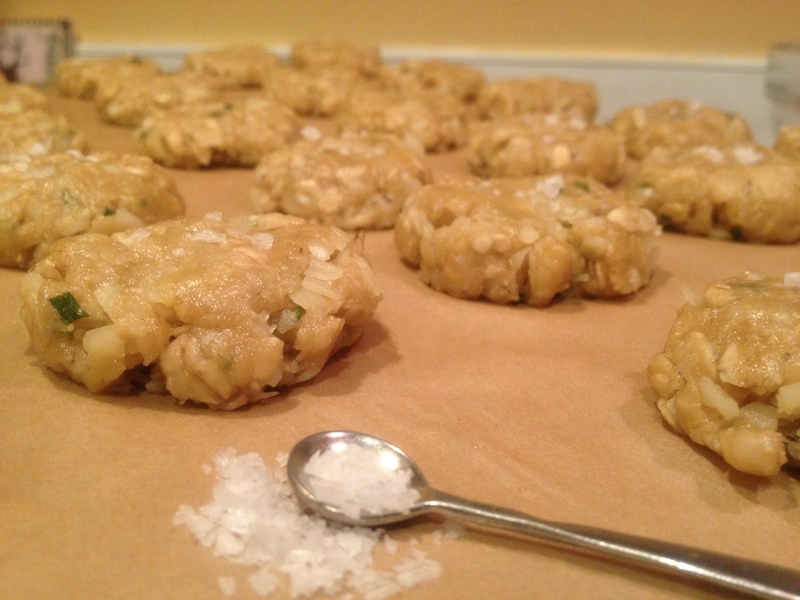 I love savory cookies, but until I saw those on TheKitchn, for some strange reason, I’d never thought of oatmeal. They certainly do sound great with a glass of port. Ooh, tell me what other kinds of savory cookies you like. I am intrigued after making these and the Parmesan and Black Pepper Shortbread. The oats really add texture rather than flavor here; I’d say the predominant flavor is the Parmesan with a rosemary background. Enjoy, and let me know if you have other recommendations! Orange and lemon thyme–yum. I am always looking for uses for my lemon thyme! Those are both great ideas. Thank you! These look simply amazing. 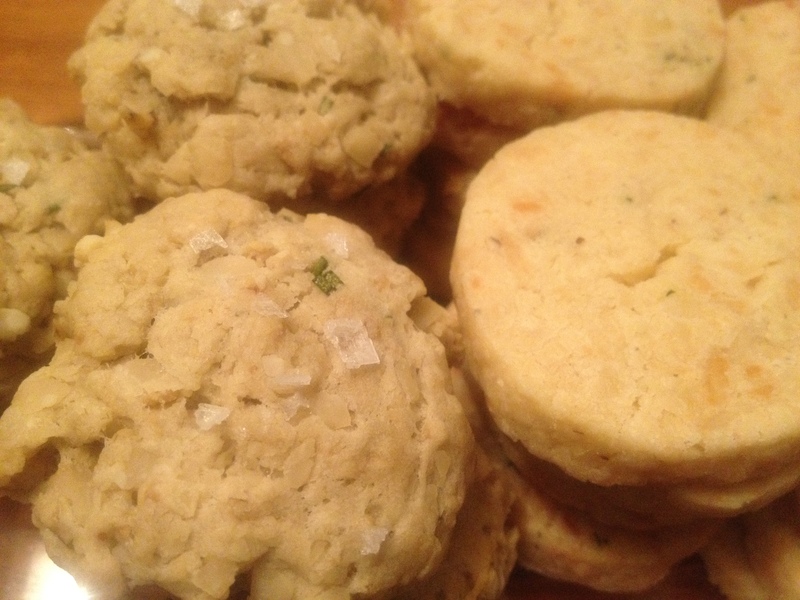 I also had never thought of a savory cookie, but will have to try these! Love your blog, I will be following straightaway! So glad to hear it! Thanks for joining us. Wow! This is a wild and unique idea. It’s like a…tea biscuit? But savory?? Looks fab. These sound so good! I’ve been experimenting with oatmeal a lot too, but never thought about pairing it with rosemary. I hadn’t either, but after I made these and got interested I found a bunch of other recipes calling for similar combinations. Now I am wondering about starting my day with some rosemary snipped into my oatmeal, maybe with a pinch of salt and a spoonful of brown butter? Just made another batch of these. They are a favorite!